‘Tis the season to spruce up that lawn! 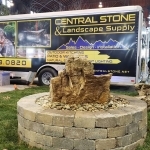 In fact, we want to ROCK YOUR LAWN with Central Stone & Landscape Supply! You could win this awesome Bubbler Fountain! Winning is easy– all you have to do is text ROCK to 217-525-9362 to automatically be registered to WIN! Plus, you can stop by to see the Bubbler Fountain in person at the Spring Lawn & Garden Sale at the Expo Building on the Illinois State Fairgrounds April 13 & 14!